Welcome to the 1st week of the Pitchfork & Crow Winter CSA! Mountain Rose Potatoes – red on the outside, red on the inside! Cooking Greens – a mix of kales, chard, and collard greens! Welcome to the first share of the 2014/2015 Winter CSA! We’re excited you chose to join us for the next 5+ months of seasonal vegetables. Most of you are continuing on from the summer CSA but we do have a handful of new folks joining us for the first winter season. We’re looking forward to the season ahead and hope you are as well. This past weekend we sent out an update email to all Winter CSA members. We included a list of important dates for the upcoming season including the every other week Tuesday pick-up dates. Please be sure to add those dates to your calendar for future reference and be sure to let us know if you didn’t receive the reminder email. Not sure where to meet us? 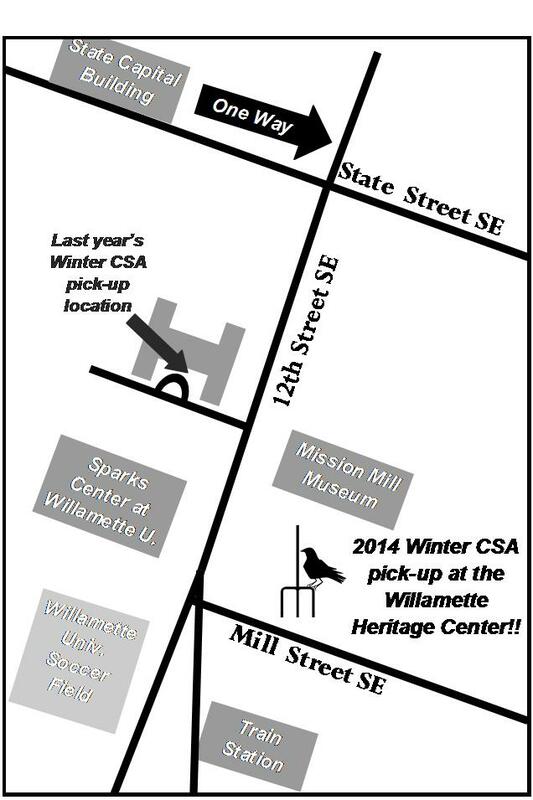 We’ll be meeting in the front parking lot of the Mission Mill Museum at the Willamette Heritage Center. Here’s a map! We know it can seem like there’s less diversity during the winter months compared to summer season CSA mix. It’s all greens, roots, and winter squash in every share. If you’re looking for inspiration we suggest joining the Pitchfork & Crow CSA member group on Facebook. CSA members have been sharing some fun recipes and suggestions there. And the photos are inspiration in themselves! Also, don’t forget that we have a recipe archive from past newsletters here on our website. Search by vegetable for recipe inspiration and new ideas. In a bowl whisk together the vinegar, the mustard, the sugar, the water, and salt and pepper to taste, add the oil in a stream, whisking, and whisk the dressing until it is emulsified. Add the chicory and the carrot and toss the salad well. Melt butter in heavy large saucepan over medium heat. Add beets and onion. Cover; cook until onion is soft, about 8 minutes. Mix in rice. Add broth and vinegar. Increase heat; bring to boil. Reduce heat to medium-low. Simmer uncovered until rice and beets are just tender and risotto is creamy, stirring occasionally, about 15 minutes. Season with salt and pepper. Spoon into shallow bowls. Sprinkle with greens and cheese. Pat chicken dry and sprinkle all over with salt and pepper. Heat oil in a 12-inch heavy skillet over moderately high heat until hot but not smoking, then brown chicken, starting skin sides down, turning over once, 8 to 10 minutes. Transfer to a plate and pour off all but 1 tablespoon fat from skillet. Add butter to skillet and heat over moderately high heat until foam subsides, then sauté celery root and garlic, stirring frequently, until celery root is browned, about 5 minutes. Add broth and thyme and deglaze skillet by boiling, stirring and scraping up any brown bits, 1 minute. Return chicken, skin sides up, to skillet along with any juices accumulated on plate, then reduce heat and simmer, covered, until chicken is cooked through, 15 to 20 minutes for white meat, about 25 minutes for dark meat. Transfer chicken to a serving bowl as cooked and keep warm, loosely covered with foil. When all chicken pieces are done cooking, transfer sauce and vegetables to bowl with chicken, discarding thyme. This is only for the people in Salem, right?